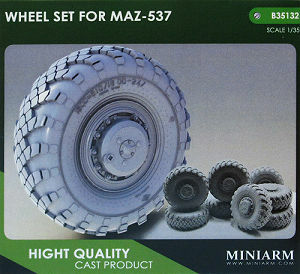 Miniarm have released this set of resin replacement wheels for the MAZ-537 series of vehicles and are applicable to the Trumpeter kits MAZ-537G Intermediate Type (kit #00211), MAZ-537G Late Production Type (kit #00212), KZKT -537L Tractor (kit #01005 and MAZ-537 Last Production (kit #01006). 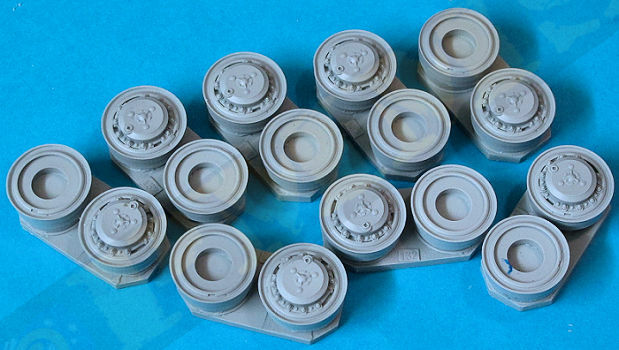 Before getting into the resin wheel set it should be noted that the Trumpeter kits #00212 and 01006 are late production types and have the early type wheel hubs the same as the earlier type kits but should have the later type rims as depicted in these resin wheels from Miniarm. 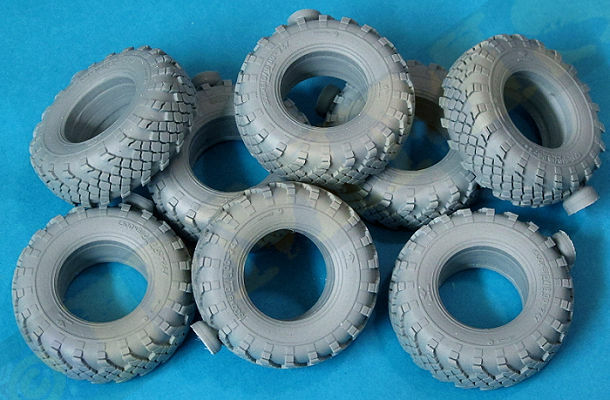 This set consists of the eight tyres plus separate wheel rims with two parts for each rim for a total of sixteen rim parts all cast in a light grey resin, the standard of casting is excellent with clean crisp details and just a small casting block on the tyres, it should be noted that the tyres don't have any "bulging effect" apart from the small flat spot when the plug is cut away. This shouldn't be a problem as many photos show these wheels with little or no "bulging" in any case but you can trim a little more from the wheels if you want them to sit a lower, this is up to the individual as always. The rim halves have sizable plugs included that need to be cut away and a good quality saw blade or power cutter is best, also when cutting it's best to rotate the hugs while making a shallow 'pilot' cut around the inner cut line, this will ensure the cut is even around the whole rim. The tread pattern has clean crisp deep detail definition that extends around the shoulder onto the wheel side walls and includes the 22 tread chevrons around the shoulder which is correct for the later tyre. There is also the sidewall data embossing but this is overly heavy and will need to be shaved or sanded down as it's virtually unnoticeable on the actual tyre unless up close. Assembled Miniarm wheels and images of actual wheels for reference. Note the lower right wheel is still fitted with the early type tyre on the later rim. 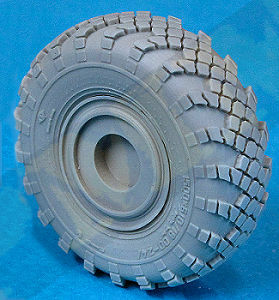 Unfortunately, there are a couple of issues with the wheel details and there seems to be some confusion between these wheels and those for the larger MAZ-543? Unfortunately Miniarm have used the 1500mm diameter when they in fact should be 1600mm diameter in actual size. Scaling this down to 1:35, 1500mm=42.85mm and 1600mm=45.7mm. 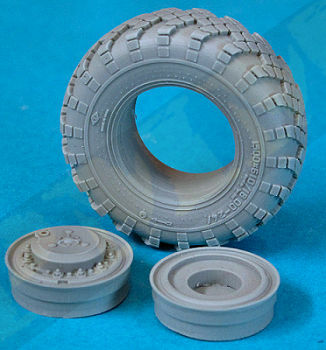 The Miniarm resin tyres are 42mm in outside diameter leaving them 3.7mm undersized to the correct 45.7mm scale diameter, which is quite substantial unfortunately. The 1600mm (45.7mm) diameter is also consistent with the tyre sizes in the 1:35 scale plans in the Tankograd books listed below which also concurs with other research. The Trumpeter kit tyres for point of interest are 44.4mm in diameter so are 1.3mm difference in diameter. 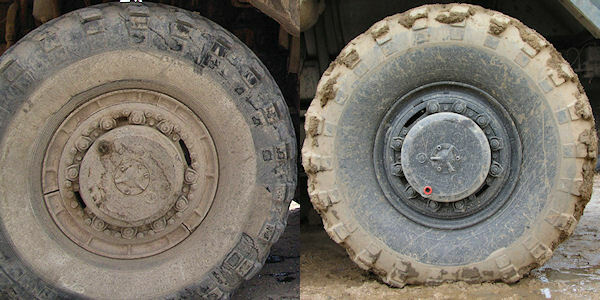 The width of the resin tyres appears okay, it leaving the outer tyre diameter as the greatest issue here. with the resin wheel touching one side of the plan for comparison. 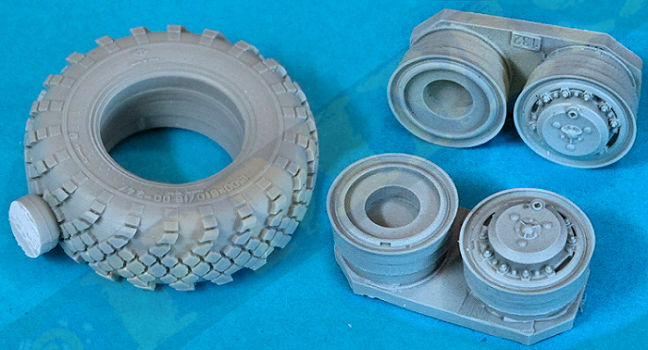 Comparison of the Trumpeter kit wheels and the Miniarm resin wheel sizes. The central large rim hub is the correct diameter but some images show it extended further out but this is not that noticeable from most angles so shouldn't really be of concern. Other hub details are nicely done and after cutting away the resin block the fit to the tyres is good. 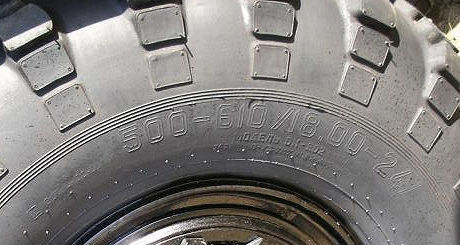 You should also note that the wheel tread pattern is handed, meaning that the tread chevron faces downward on each side of the vehicle when looking from the front and having the rims separate means you can easily fit the outer rim on either side of the vehicle to have the tread chevron pattern direction correct. On the inside rims are large holes designed to fit over the Trumpeter kit wheel mounting hubs (parts D20/D53) but the hole is slightly too small and will need to be enlarged a small amount, this can be done by running a #11 blade around the opening to shave a small amount off the hole sides and the wheels will then fit directly to the kit hubs. 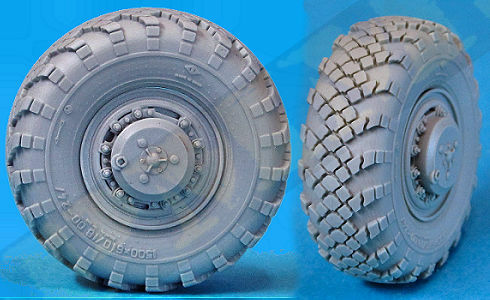 As a footnote, the larger MAZ-543 wheels are as noted also 1500mm in diameter (as the resin tyres depict) and with the separate hubs and I was able with minor trimming of the Trumpeter MAZ-547 kit hubs fit these to the Miniarm resin wheels with a thought they might be usable as MAZ-543 wheel replacements? 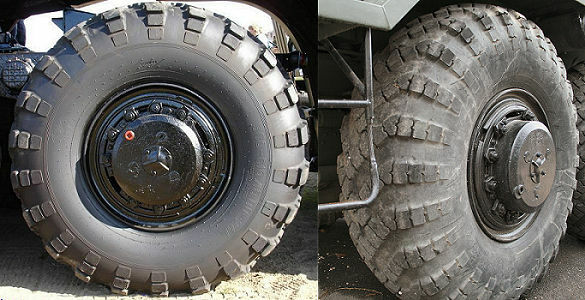 Unfortunately, the width of the tyres is quite different with the MAZ-543 being much thicker (wider) than the narrower MAZ-537 tyres, so that idea didn't go far sadly. 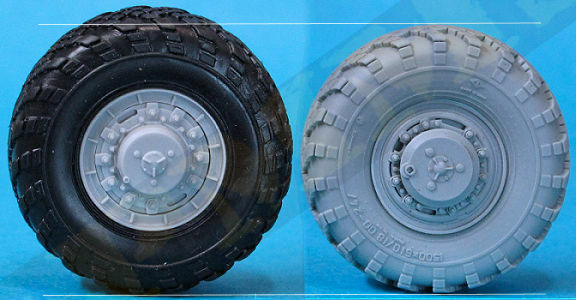 These new resin wheels from Miniarm while cleanly cast and with very well done tread pattern and hub details the issue of the tyres being nearly 4mm undersized is quite substantial and a major negative when considering these as an upgrade for the MAZ-537 kits and makes them hard to recommend if you want accurately sized wheels unfortunately. Thanks to traumatised bank account and for the review sets. Sets yes, I actually bought two of these sets for kits I have, Oh dear, what to do with them now??? ?